Crush washer antd pin not included. $75.00 / Trade for Ammo, Firearm parts or Accessories. 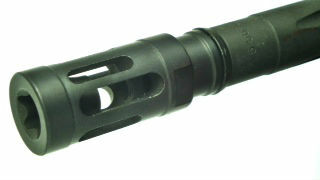 Compatible with A2-mounted suppressors due to unique external geometry. Tuned slots and interior cone offer maximum in recoil mitigations, compensation of muzzle-rise, and flash reduction. Dual action brake minimizes side pressure and designed to have much less noise associated with typical compensators. Makes it perfect for working in teams for CQB. 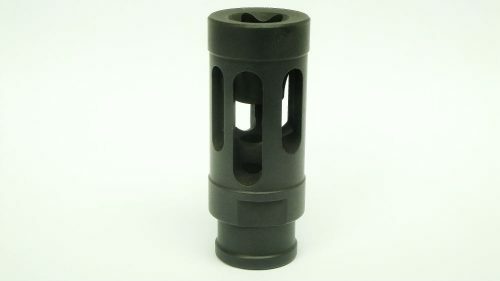 It is a compensator that is built for the 21st Century Gunfighter! Predrilled hole at the base for permanent installation. .Threaded 1/2 x 28 for 5.56mm AR15 platforms. Extended version of the MOD 0 – 5.56. Bulgarian Makarov Bakelite Grips with Screw.